Neath Rugby Supporters Club have made their first donation the Neath Rugby playing squad. The supporters club was formed earlier this year in order to raise funds to help back the Neath team in their quest to return to the top of Welsh club rugby. 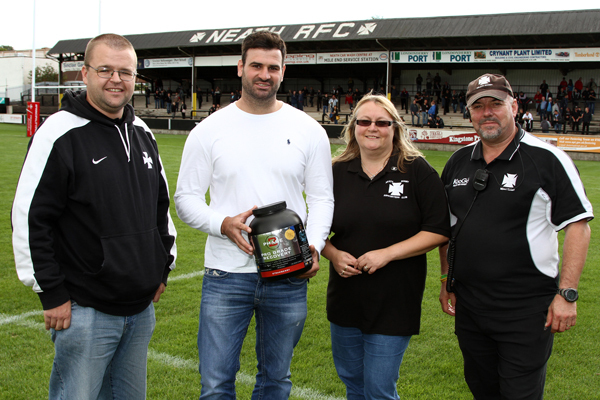 A gift of nutritional supplements are the first items to be given to the team by the supporters club. They were handed over by members of the Supporters Club to Neath Rugby captain Lee Evans at Neath’s game with Llanelli on Saturday afternoon. It is hoped that this will be the first of many presentations the supporters club will make to the squad this season. Speaking after the presentation, a spokesman for the Supporters Club said “We never intended to make this donation so early in the season, but thanks the phenomenal take up in membership we find ourselves in a position to help out the squad much earlier than anticipated”. Neath captain Lee Evans said “We are very grateful for the backing of the Neath Rugby Supporters Club in providing the squad with these supplements. The supplements are very important to the players and are crucial in helping us perform to the best of our ability”. Fans of Neath Rugby who wish to join the supporters club can do so at any home game. Membership costs just £10 for the season. This entry was posted in News and tagged Lee Evans, Llanelli, Llanelli RFC, Neath, Neath Rugby Supporters Club, Squad, Supporters Club, Welsh Rugby Union. Bookmark the permalink.